I have been wearing minimalist racing goggles for years and I love them. I have worn them in the pool, in triathlons and in ocean swims. Recently, I decided to step outside of my goggle comfort zone and bought a pair of blueseventy's Vision open water goggles. The Vision goggles are bigger than the racing goggles that I am used to. The advantage of being bigger is that they greatly increase the range of vision. When I tried the goggles in the pool, I was surprised at how much more of the lanes around me I could see. According to blueseventy, the curved, wide angle lenses allow for a 180 degree range of vision. These are the only goggle that I know of that come in different sizes. The frames can be ordered in small or large to accommodate different face sizes. Vision goggles come in many frame and lens colors. I chose the black frame with mirrored gold lenses. I chose this color scheme partly because I think they look really cool, but also because I wanted mirrored lenses for swimming in sunny conditions. The frames are flexible and come in orange, white, black and pink. Since different colored lenses are good for different weather conditions, the Vision lenses are available in many colors including yellow, smoke, blue mirror, silver mirror, gold mirror and pink. All lenses offer anti-fog and UV protection. The Vision goggles are the official goggles of the FINA 10km Marathon Swimming World Cup, and after taking them for a test run in the pool I can see why. They are comfortable, allow for a wide range of vision, come in lens colors for every weather condition and they look cool. I am looking forward to the weather warming up so that I can try them in the open water that they were designed for. 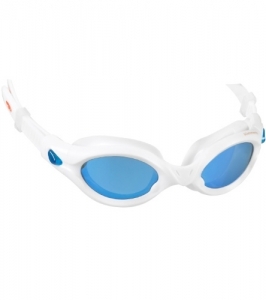 Blueseventy lists the goggles at $25, but I found them on Amazon.com for under $20 (not including shipping). Considering I have spent the same or more on my minimalist racing goggles, I think the price is reasonable. Has anyone else tried these goggles? If so, what did you think about them?